I decided to go back to basics, I was going to draw a pen sketch to later watercolour, but having problems with this smooth watercolour card stock, which really does need stretching, I decided to take the sketch further and build up the scribbles to give the effects of shade, highlights and tone, I held the pen mainly at the very top, so create a free scribble! Only occasionally holding it in the usual way, when I needed small areas carefully built up in scribble! I also tried to scribble in the direction of the fur, in the hope it would give a better finished result. 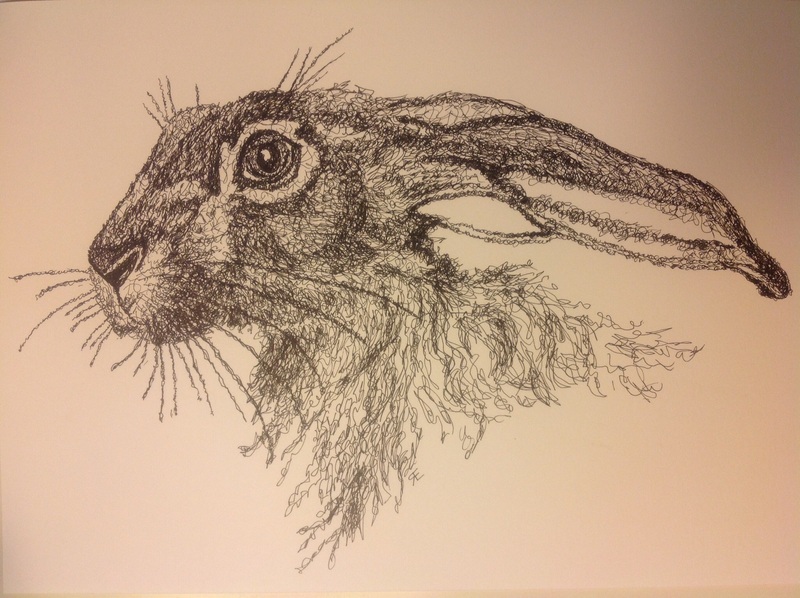 This entry was posted in art, Hare, pen, Scribble and tagged art, Hare, painting, Painting, pen, scribble. Bookmark the permalink. Give it a try, I have never done it before, and it is easier than you think, I think the results look better than the effort put in( always good) you just need a good pen, like uni pen, build up more scribbles in the darker areas.